Stay at this amazing tree house at Nusa Penida island, and immerse yourself completely to the natural surroundings of the place. 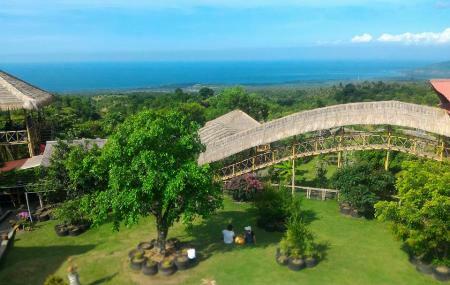 The unique experience of staying in a treehouse, surrounded by views that’ll take your breath away, Rumah Pohon is perfect for a romantic escapade. This simple accommodation prides itself over the sunset and sunrise views, the proximity to nature and the possibility of interacting with wildlife. This will be your very own Jungle Book experience! Highly recommend! The treehouses are really cool and a unique place to stay. The owner is such a nice guy- cooks good breakfast and dinner included in price. He even helped us get a motorbike delivered at a good price (a car or bike is necessary). He wasn’t intrusive but was available and helpful when we needed him. Even showed us which tree houses where best for watching the sunrise and sunsets. Definitely stay here if you get the chance! Stayed Here For 24 Hours, And Thats The Best Stay On A Hill Top Wood House Ever. The Owner is A Fantastic Person.He Never Asked Us About The Rent Till The Last Second We Planned to Move. He Makes Sure That We Are Enjoying The Time There. Proper Food at Time, Campfire, Wi-fi And A Lovely Dog For Security ❤ Best and Highly Recommended. This place is awesome! Great value for your own little treehouse on the sky! Kind of hard to find, have to drive up Pettingian road and park on the right where it says Rumah Pohon (Treehouse) then walk about a hundred meters down a little dirt trail to the Treehouse village! Because it's remote it's quiet, and there are no mosquitos, and it's got a great breeze. Beautiful sunsets and sunrises. Amazing. Dinner and breakfast included, I highly recommend it! I have an unforgetable experience here! Overall it was a nice experience to stay. affordable and has beautiful scenery. I tried flying fox and got free dinner and breakfast here. Wonderful! The place is really amazing! The view is incredible, in the evening we had a bonfire, nice dinner and breakfast included, the zipline is also great and staff amazing! Only small thing was, we had ants in our bed, which is understandable in a treehouse, but it would be enough to clean the blankets before. But overall great experience!